The Jean-Pierre Rambier family has owned the domaine Haut Lirou for more than five generations. This historic area of ​​the Pic Saint-Loup appellation extends over the foothills of the Pic Saint-Loup, in an enchanting landscape. Cypress paths along the vineyards, Mediterranean sunshine, luminous hills ... The Haut Lirou vineyards are almost one hundred hectares of vineyards cultivated on clayey-limestone soils in the heart of the scrubland. These limestones characteristic of the Pic Saint-Loup region constitute a poor and stony soil for the grape varieties which derive all its minerality. On the slopes of the Pic Saint-Loup or on the plateaux at 250 meters of altitude, a significant contrast of temperatures between the day and the night proves favorable to a good maturation of the berries. The vineyards of Haut Lirou represent more than 90 hectares, spread over the hills around Saint Jean de Cuculles, a picturesque village in the Southern Languedoc hidden in the garrigue. The vineyard inspires harmony and elegance: an art of living that the wines of the domain translate to each vintage. To obtain such nectars, the vine growers conduct a traditional and reasoned viticulture: size, short to contain the yields, aeration of the soil, leaf stripping, palissage, natural manure. 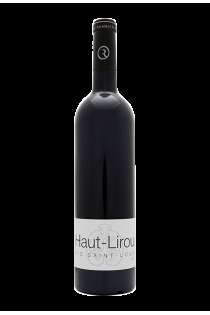 At Domaine Haut Lirou, the grapes are handmade to better preserve the grapes, which will then be severely selected. The vines are vinified in separate vats, enclosed by closed. Then, the aging is done in French oak barrels for 12 to 16 months. The appellation Pic Saint Loup is the northernmost of the Languedoc-Roussillon AOC. Its characteristic terroirs and its climate have a decisive influence on the wines, which lasts from vintage to vintage. The grapes grown in the Haut Lirou estate are typical Mediterranean varieties: Syrah, Grenache, Mourvèdre, Viognier ... They produce aromatic wines that restore the scents of garrigue and evoke Mediterranean vegetation for tasting; Green oak, Aleppo pine, thyme, rosemary ... The AOC Pic St Loup wine from the domaine Haut Lirou reveals notes of red fruits and spices. On the palate, its supple tannins enchant the tasting.